research to look at a complaints procedure that can be adopted by all of Clackmannanshire's community councils, but not as a provision in the Scheme at this stage. This stage of the consultation resulted in a change to the proposed provisions for replacing elected community councillors who resign within their term of office. There will now be a provision for co-option. There were other amendments to wording for the provisions relating to the dissolution and suspension. The outcome of Stage 3 was reported to Council at the meeting on the 12th of April 2018. 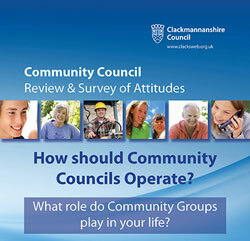 Community councils and residents tell us that the governing framework Clackmannanshire Council sets out to help community councils operate democratically could be improved to suit people's current lifestyles and interests. The framework which sets out how community councils should operate is a fairly long, detailed document called the Scheme for the Establishment of Community Councils (the Scheme). Changing it is a formal process. We have already asked people to tell us their views on community council boundaries and compostion and their attitudes to community group activity to give us a picture of how people feel about taking part in community activiy and so help us shape the governing framework. We are continuing our call for people to tell us about our suggestions for updating the governing framework for community councils (the Scheme) to help residents play a greater part in the life of their community. You can do this by looking at the proposed draft Scheme and submitting your comments, or by looking at the particular aspects we think need your attention and telling us how you feel about them. There are two separate questionnaires. We will consider the results of both in deciding on the content of Clackmannanshire's Scheme. You have the option to complete one or both questionnaires, depending on your interests. This is the third stage of consultation. The findings will be presented to Clackmannanshire Council in April 2018.